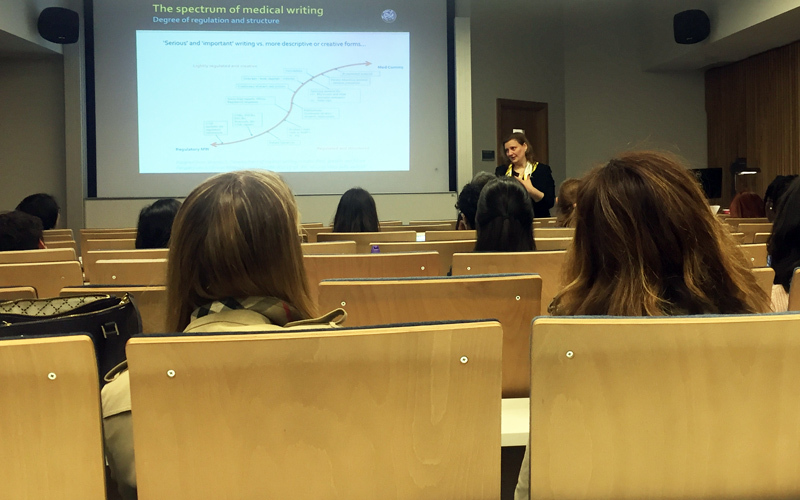 The seminar, held on 16 May 2018, was a collaboration between The Bartlett, the European Medicines Agency (EMA) and the UCL Populations and Lifelong Health Domain Early Career Network (ECN). After a welcome from Professor Andrew Edkins, Director of the BREI UCL, the introduction was given by Dr Evangelia Chrysikou, member of the Board of the ECN Committee and Lecturer at BREI, who outlined the work of the ECN Committee and the Institute. They showcased the multifaceted work of the EMA in MW and in the context of its importance in public health. Dr Petelos elaborated on the evidentiary requirements of submissions to the EMA up to the Marketing Authorisation, with Dr Mehta explaining in detail the output of the Agency, including processes and communication with healthcare professionals, patients and citizens. The seminar was highly interactive, with the opportunity for questions from attendees throughout, as well as informal discussions with the presenters after the event. Attendees went away with an understanding of the diversity of this particular path and its importance from a public health perspective, along with tricks of the trade. The seminar also generated an interest among those who were considering this career from a post-grant/post-doc background. Participants gave very favourable feedback on the content, delivery and relevance of the workshop. Comments indicated that needs and expectations extend well beyond a career event to writing workshops with a similar focus, with more interactive sessions on medical writing and communication. The provision of insight into regulatory aspects was also favourably commented on, with the information on evidentiary requirements and processes extremely welcome, particularly as this remains a largely neglected aspect in biomedical education.